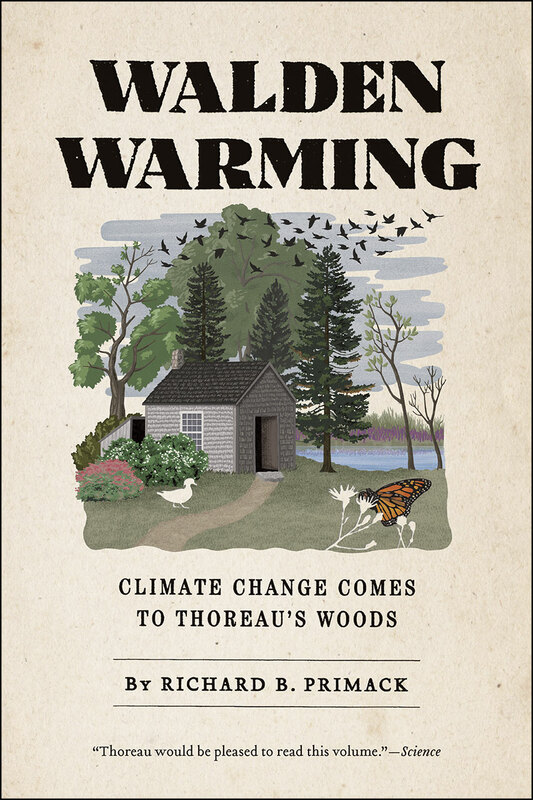 In Walden Warming, Richard B. Primack uses Thoreau and Walden, icons of the conservation movement, to track the effects of a warming climate on Concord’s plants and animals. Under the attentive eyes of Primack, the notes that Thoreau made years ago are transformed from charming observations into scientific data sets. Primack finds that many wildflower species that Thoreau observed—including familiar groups such as irises, asters, and lilies—have declined in abundance or have disappeared from Concord. Primack also describes how warming temperatures have altered other aspects of Thoreau’s Concord, from the dates when ice departs from Walden Pond in late winter, to the arrival of birds in the spring, to the populations of fish, salamanders, and butterflies that live in the woodlands, river meadows, and ponds. Primack demonstrates that climate change is already here, and it is affecting not just Walden Pond but many other places in Concord and the surrounding region. Although we need to continue pressuring our political leaders to take action, Primack urges us each to heed the advice Thoreau offers in Walden: to “live simply and wisely.” In the process, we can each minimize our own contributions to our warming climate. "This book is more than a clarion testament to the real and present effects of climate change. It is an exhortation to become more engaged in the natural world whether through citizen science or observation, and, in so doing, recognize and limit our own impacts on the earth. A constant presence throughout this book, Thoreau would be pleased to read this volume, which weaves together science, nature, ethics, and human action as part of a single whole." "Primack’s story is worth telling, and Primack is a worthy storyteller. . . . Primack clearly demonstrates the value of several non-traditional forms of historical observations for documenting change, including personal journals, butterfly club observations, and fishing lodge records. Perhaps most importantly, Primack clearly demonstrates that our environment is changing rapidly, and this is undoubtedly due to anthropogenic climate change."